Auto parts sculpture, "Ingenious Don Quixote"
Eternally romantic, Don Quixote pines after his beloved Dulcinea after battling windmills he believed were giants. An admirable character in Spanish literature, Don Quixote was created by Miguel de Cervantes de Saavedra, inspiring this endearing sculpture by Armando Ramírez. As ingenious as this millenary personage, Ramírez recycles several auto parts into a vivid sculpture including a generator cap for the helmet, connecting rod for his back, a thick wire for the lance, Bendix pieces for the legs, and a rocker arm for Quixote's chest. Ramírez also gives use to discarded pieces off a die machine, wires, and a small tricycle rim for the shield. 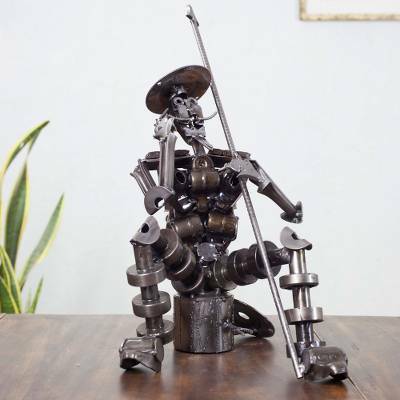 You can find auto parts sculpture 'Ingenious Don Quixote' by Armando Ramirez in sculpture categories such as Recycled Metal Sculpture, Eco-Friendly Sculpture and Metal Sculpture. Enjoy exploring these sections for other Novica treasures.